Keen to learn but short on time? Get to grips with the life and career of Marie Curie in next to no time with this concise guide. 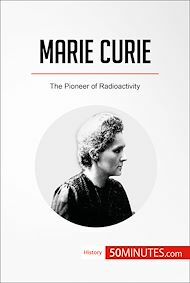 50Minutes.com provides a clear and engaging analysis of the life and work of Marie Curie, whose pioneering work on radioactivity revolutionised our understanding of the nature of matter and paved the way for innovative new treatments of cancer and various other illnesses. With Nobel Prizes in physics (1903) and chemistry (1911), Curie overcame both sexism in the overwhelmingly male scientific world and xenophobia after moving to France from her native Poland to carve out a place for herself at the forefront of scientific research. Her tenacity, intellectual brilliance and determination to use her discoveries to develop new medical treatments through the Radium Institute make her a role model for individuals of all nationalities, genders and walks of life.